1. The U.S. hotel industry’s occupancy increased last year by 5.7%, from 51.9% in 2009 to 57.6% in 2010. "2010 will be known as the year of demand recovery,” said industry spokesman Mark Lomanno. 2. Shipping at the Port of Portland increased by 27.6% in 2010, and by 34.6% at the Port of Seattle. 3. Passenger traffic at Dulles International Airport increased by 4.7% in November 2001 compared to the same month in 2009. 4. Hong Kong International Airport (HKIA) set new annual records in 2010 for both: a) the highest-ever passenger count, which increased by 10.3% to to 50.9 million passengers, and b) cargo freight, which increased last year by 23.4% to 4.1 million tons. 5. 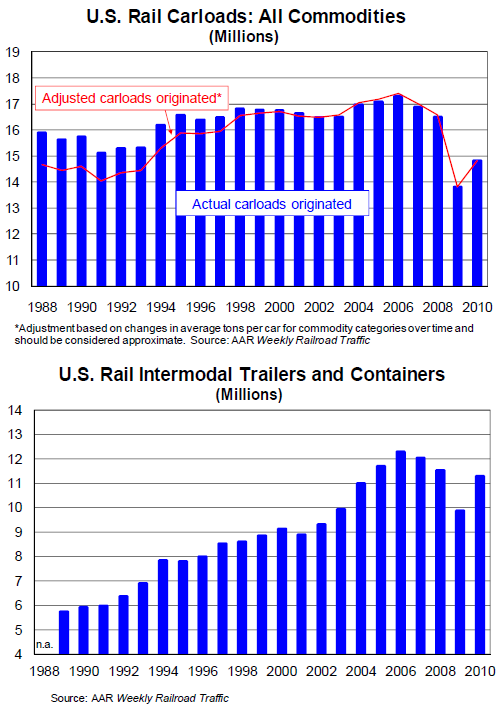 Rail traffic in the U.S. registered another improvement for the week ending January 15, with carload volume up 7.5% compared to the same week last year, and intermodal volume up by 5.8%. 6. Year-over-year container traffic at the Port of Los Angeles surged 16% in 2010, with a record number of exports leading the way. Exports rose 10.3% in 2010 to 1,841,274 TEUs compared to 1,668,911 in 2009 and surpassed the previous container export record of 1,782,502 TEUs in 2008. Related: See Scott Grannis' positive economic new roundup yesterday. BTW, the hotel numbers are actually better than they look. A lot of people have trouble reporting percentage gains. While the occupancy rate improved by 5.7 percent, the number of rooms demanded was boosted by 10.9 percent--almost 11 percent. If this is QE, pour it on, Bernanke, pour it on. Pull out the corks, tip the barrels over, set the whole damn house on fire. Turn up the volume, blow the doors off the hinges--we got ourselves a boom, baby. Inflation is dead in the water, and as goods, services, capital and labor pour into the USA to meet demand, inflation is no-go for many, many years yet. The whimpering anti-QE forces, already scuttling to the sidelines with their tails between their legs, will soon change their tune. Bernanke is one smart, well-informed and circumspect fellow. This is his hour. He is answering the call. The right man at the right time. If the economy is so great, why is unemployment so high more than a year after the downturn was officially declared over? What happens when Bernanke quits pouring it on? Has there ever been a Fed Chairman who was not considered a genius while in office? If our Fed Chairmen are so great why did this recent bad economy ever happen in the first place? Why should Bernanke ever quit? He can pour it on for several more years, until this economy reaches breakaway speed. We may be entering a new era--one requires monetary,not fiscal stimulus. And with interest rates low, that means QE. The nice thing about QE is you don't end up with budget deficits. Jeez, what is a wrong with a boom? A rising tide lifts many boats, and the tide is coming in very high n the next few years. Run the economy like a Banana Republic become a Banana Republic! This happy talk about how good things are is getting long in the tooth. It reminds me of the Johnson Administration’s 1967 public relations campaign to convince Congress, the press, and the public that there was progress in Vietnam and that the war was being won. Johnson was advised to emphasize light at the end of the tunnel. Here light at the end of the tunnel has become leading economic indicators that never seem to lead. Bernanke, to his credit, is trying to do something limited and dangerous as it is. Faced with Chinese cheating on their trade commitments and the value of their currency the dynamic duo of Obama-Geithner consistently wimp out as did the Bush Administration. In 1971 Richard Nixon acted against a trade deficit with Europe and Japan as did Reagan in the 1980s. Where have the leaders gone? They seem to have been replaced by Pollyananas. The prevention of a V-shaped recovery, over the past two years, and reaching full employment in another five years or so, will have long-term consequences. The soft recovery means the U.S. economy will be weaker when the last of the 80 million Baby-Boomers (born between 1946-64) reach 65 in 2029. There may be a long-wave bust in the 2030s worse than in the 1930s or 1970s. Also, by 2030, China will have an aging population from its one-child policy, and seems destined to end-up in worse shape than Japan, because of its disastrous economic policies. The U.S. hotel industry’s occupancy increased last year by 5.7%, from 51.9% in 2009 to 57.6% in 2010. "2010 will be known as the year of demand recovery,” said industry spokesman Mark Lomanno. Is 57.6% supposed to be great news? Given the discounts being offered shouldn't we be seeing numbers in the 70s? Yet, five years later shipments are below the 2006 peak. But the number of passengers and passenger miles are still well below the peak even though population has grown. Wonderful. I guess that China has been recovering faster than the US. Still has a while to go to get near the historical peak and more yet if we want to adjust for the population growth.